Get a behind-the-scenes glimpse of what it takes to be considered one of the worst figures in history, with this second book in a brand-new nonfiction series that focuses on the most nefarious historical figures. In 1888, London was terrorized by a mysterious man with a knife. Between the end of August and beginning of November, this man committed five known murders—possibly more. Then, just as suddenly as they started, the killings stopped. Dubbed “Jack the Ripper” by the press, he slipped through the dark, foggy streets of London’s Whitchapel district, targeting women and leaving no witnesses and no clues as to his identity. The police were stumped. The press went wild. But no one could find Jack the Ripper. Even today, Jack the Ripper continues to fascinate. Amateur detectives, known as “Ripperologists”, books, movies, and walking tours all focus on one question: who was Jack the Ripper? 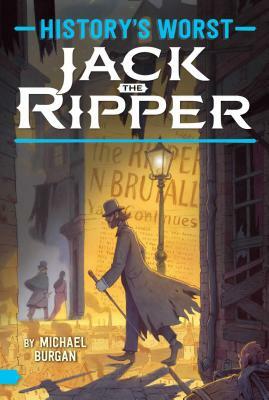 Get a little closer to finding out with this biography that takes a deeper look at Jack the Ripper…because while he may be one of history’s worst people, his legend lives on. Michael Burgan has written numerous books for children and young adults. Many of his books have focused on US history, geography, and the lives of world leaders. He has also written fiction and adapted classic novels. Michael has won several awards for his writing, and his graphic novel version of the classic tale Frankenstein (Stone Arch Books) was a Junior Library Guild selection. Michael graduated from the University of Connecticut with a bachelor’s degree in history. When not writing for kids, he enjoys writing plays, and his works have been staged across the United States. He lives in Santa Fe, New Mexico, with his cat, Callie.